Enjoy diving, tropical paradise, Caribbean cuisine, and avoiding taxes? Grand Cayman, the largest island of the Cayman Islands, is definitely for you. Known both as one of the Caribbean’s top tourist destinations and tax havens, the Cayman Islands make it really easy for you to visit. The island of Grand Cayman has many different sides. For one, it has five distinct districts: Bodden Town, East End, George Town, North Side, and West Bay. The western regions make up tourism central, with George Town being the country’s largest city, financial center and capital. You’ll find all the usual fixtures here, from fast food restaurants, to night clubs and resorts. Meanwhile, the eastern districts offer more restaurants specializing in native Caymanian cuisine. One of the island’s biggest tourist attractions is West Bay’s turtle farm. Though cute and adorable, don’t fall in love too easily with these turtles– the majority of Green Sea Turtles are raised for their meat, a traditional food in Caymanian culture. But many of them are released back into the wild (over 30,000 in the last 30 years). The farm also boasts resident Blue Iguanas, which are very rare, and a caiman too. If you’re a beach lover you won’t want to miss Seven Mile Beach on Grand Cayman’s west side. It is a long crescent of coral-sand beach, world renowned for its beauty, and it recently received the honor of “The Caribbean’s Best Beach” from Caribbean Travel and Life Magazine. Since this beach is public property, you are free to walk its entire length. Recommended! Snorkelers and divers are sure to instantly fall in love with Grand Cayman. 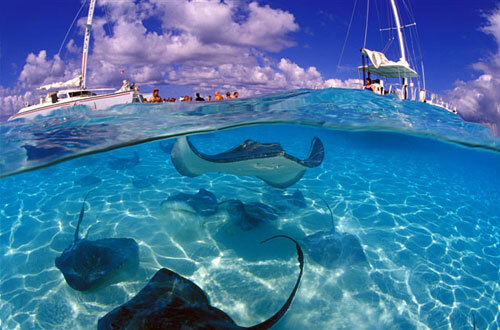 One animal known as frequent visitors near Grand Cayman are stingrays. Stingray City, located a short boat ride from the northern end of Grand Cayman, is a series of shallow sand bars where Southern stingrays are found in abundance. And don’t worry, these rays are pretty tame: visitors can feed, pet, and interact with the animals. The stingrays can grow to (100 centimetres (39 in) or more in span). A trip from a local tour operator will usually include snorkeling in coral gardens before or after arriving at Stingray City too. Of course, many people come to live here for the financial benefits too. Since 1972, the Cayman Islands have had their own currency, whose basic unit is the dollar, issued in notes with denominations of CI$100, 50, 25, 10, 5 and 1 and coins valued at 25 cents, 10, 5 and 1 cent. The CI dollar has a fixed exchange rate with the US dollar of CI$1.00 equals US$1.25. Or, the US dollar equals CI $.80. But more importantly– the Cayman Islands are also a tax haven. There is no direct taxation imposed on Caymanians and Cayman Islands companies. All in all, the Grand Cayman has everything you’d expect from a Caribbean Island paradise. Is there anything more that needs to be said? I’m not 100% sure about the types of stingrays in Grand Cayman, but here in Fort Myers where I live (also in the Gulf of Mexico), they are dangerous only in the sense that if you accidentally startle or step on them you can get stung. Our stingrays are not huge like in the Crockadile Hunter show, and the barbs are small in comparison. They are good natured creatures and will even let you pick them up. They don’t bite, and will usually only sting if they feel threatened or if you accidentally step on them while they are on the sandy bottom resting or breeding. Stingrays at Rum Point Beach are gentile, in a word amazing. You won’t regret going, its a once in a lifetime experience. Stingrays are gentle giants. We swam with them in the Cayman and love every moment of it. We are going back next month and taking our 14 year old son to experience it. They remind me of a large puppy just wanting to be loved. They will bump you and all they want is attention. They are precious creature and if you like the ocean, you will love them. You will remember the swim forever!! !